MultiPANEL has a hardwood waterproof plywood core making it similar to wood to work with. The wall panel is laminated with a choice of 30 beautiful finishes from which to choose. With MultiPANEL you can create a shower cubicle, kitchen splash-back or broad expanse of beautiful waterproof and easy-to-clean walling in a fraction of the time taken by conventional methods. Multipanel is available in a standard panel size of 2400 x 1200 x 11mm. Narrower panel widths of 2400 x 900 x 11mm and 2400 x 598 x 11mm are available to minimise off cut waste. Edge finishing strips 2.5m long are available in 5 finishes for fixing at internal and external corners, as well as end caps and capping pieces. Alternatively panels can be finished with a PVC edging to compliment your chosen décor. With Mulitpanel your imagination is the limit. Although perfectly suited to bathroom and kitchen environments, Multipanel is at home wherever you might have considered a ceramic tile for the covering surface. Hygienic and easily cleaned with an assortment of hi gloss and matt finishes, the easy to apply Multipanel provides a finish worthy of highly skilled tradespersons. 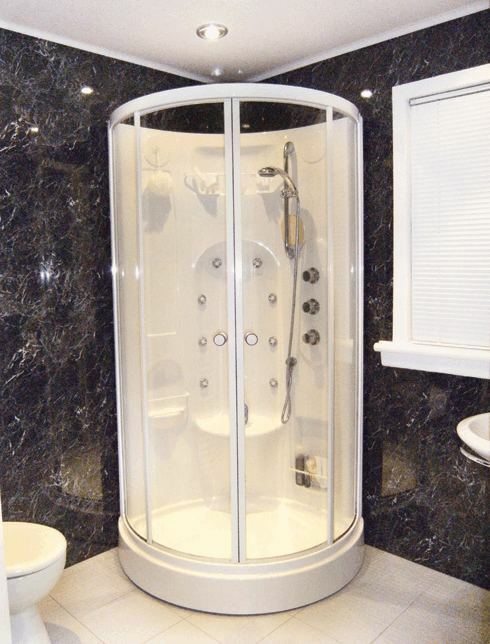 Bathrooms, kitchens, cloakrooms, shower enclosures, splash backs, utility rooms, surgeries, treatment rooms, offices, waiting rooms, schools, workshops, lobbies, entrances, changing rooms, pet parlours, retail areas, exhibition stands, partitions, in fact anywhere you want a beautiful finish to the highest standard! Please choose from the 30 different colours and textured finishes available. Please be aware that your monitor settings can affect how colours render.